As the said by a famous proverb "change is the only constant." Look at the topics and specifically show how attitudes, events or people have changed. 1. Voting Rights in America--When our country began, only male white property owners could vote. How has voting rights changed in our country? 2. Prohibition--The 18th amendment was ratified on January 25, 1919. It prohibited the production, transport and sale of alcohol. What led the country to make these changes and why was the amendment later repealed? 3. Climate change--What has contributed to changes in the weather patterns? How has our country felt about this and what is being done? 4. Women's rights in America--In the State of the Union address President Obama addressed the issue of women being paid less than men. Much has improved, but there are still some equality issues. Show how women's rights have changed in America. 5. Uprising in Egypt and continued unrest--A popular uprising began on Jan. 25, 2011. Why were the people protesting, and what has happened in Egypt since then? 6. Fall of communist U.S.S.R (Russia)--On Dec. 25, 1991 the Soviet President Mikhail Gorbachev resigned. Two weeks later the Soviet Union and its republics were dissolved; the cold war was over. Why did these major changes occur? 7.. Jim Crow Laws--The rise and fall of Jim Crow Laws. When and why were they first passed and how were they finally repealed? Create a timeline at timetoast.com. Choose a free account and activate your account using your email. Add a title for your timeline, add each individual event with a title and date, upload a picture, and type your description of the event and its change. 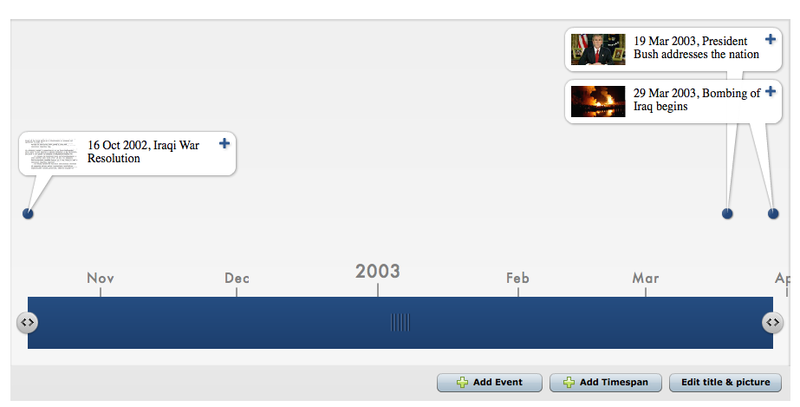 When you have finished adding your 8 events, add the timespan of your total timeline (example 1984-1994).